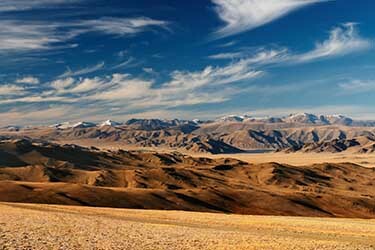 Climate and weather in Mongolia - By Mongolia Travel and Tours. Mongolia - because of its high altitude and of its situation far from any sea - has an extreme continental climate: very cold winters, with temperatures which can reach-30°C, and short, but warm summers, particularly in the Gobi Desert. The sun shines on average 257 days a year, the country being generally in the heart of a system of high pressures. 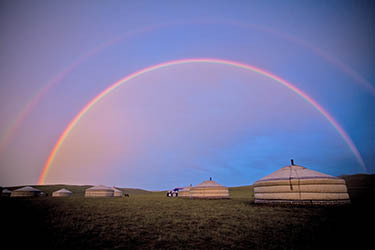 Mongolia is moreover nicknamed the "Country of the Blue Sky". As a consequence of this omnipresent sun, the rain is very rare in Mongolia: an annual average from 200 to 350 mm in the North, which decreases by going southward, the extreme south being occupied by the Gobi Desert, where certain regions receive no rain during years. The four seasons are very different in Mongolia. You will often hear that in Mongolia you can have 4 seasons in the same day. This is true especially during the intermediate seasons in May or September. Summer in Mongolia begins in June and ends late August. The weather is warm (20-25 °C in most parts of the country) and pleasant. These summer temperatures are tempered by altitude in the Altai mountains and in the Orkhon Valley, or by latitude for Lake Khövsgöl. In the Southern Gobi Desert, the temperature is noticeably higher. Indeed, in this region, shade is hard to find, the thermometer reaching average temperatures of 40 degrees. Even in summer, be prepared for all kinds of weather as it can change quickly, especially in the mountains. Autumn in Mongolia begins early, at the beginning of September, and lasts the entire month of October. 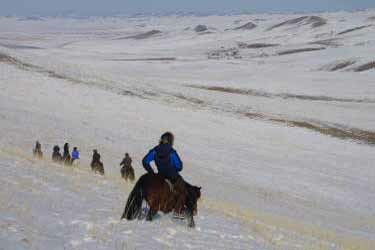 Winter in Mongolia lasts about four months, from November to February. Temperatures are very low, they can reach -30 °. It's a dry cold, the sky is blue and there is very little snow, except in northern areas. A trip at this time is possible, with good preparation and good equipment. It is a wonderful experience because nomads do not expect to meet foreign visitors during this period and will welcome you warmly, in the frozen steppe. Spring in Mongolia begins in March until the end of May, with temperatures which become positive again. Sandstorms can occur in the frontier regions of the Gobi Desert. 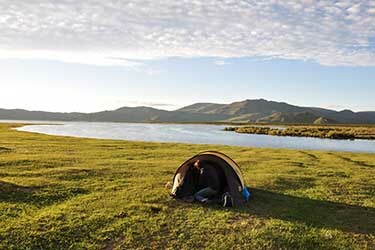 The best time to travel to Mongolia is from mid-May to late September (see "tips to choose your tour in Mongolia").